Saturday Oct 8th Marked the 3rd Annual S-Town (Stamford, CT) Pre-Halloween Rager. And WHAT A RAGER IT WAS. FLO has spun the party for the past 2 years but unfortunately I missed them both. In Oct. of 2010 I was away in the Carribbean spinning on Norwegian Cruise Line Epic Ship, and 2009 I spun up in Boston, MA. 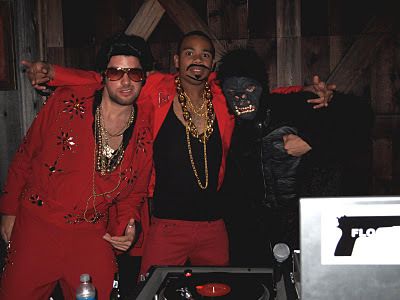 In 2011 However, I was at that freaking party and it was hands down the best Halloween party I have been to, to date. The decorations were sooo elaborate… from the decapitated Barbie doll exhibit, to the skeletal flamingo carcasses, to the mirror/mummy fields!! I Swear I can’t even make this stuff up. DJ FLO_Rilla & myself DJ Jones’Ye West were set up in front of a haunted barn with a vintage carpeted dancefloor & 350 freaks stomping around on it, IN THE WILDERNESS! It was bananas. I know the two bartenders got WORKED that night for the $25 open bar & the two Porta-John lines were dumb long. So long story short.. people got it in. Can’t wait to spin this one next year… love when Halloween comes early. Here’s some pics, enjoy!